George Clooney’s third film as a director – Leatherheads – is a real departure from his first two efforts, Confessions of a Dangerous Mind and Good Night and Good Luck. 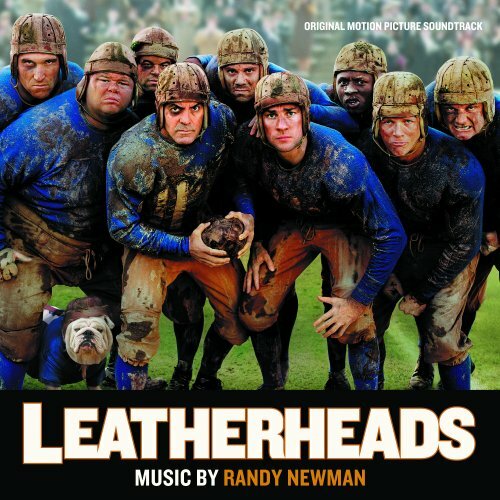 Whereas those films were serious political dramas, Leatherheads is a light-hearted 1920s caper about the early days of professional American football. Clooney plays Dodge Connolly, captain of the struggling Duluth Bulldogs, who convinces a good looking college football star and war hero, Carter “the Bullet” Rutherford (John Krasinski), to join his team. However, before long, the two men find themselves competing for the attentions of Chicago newspaper reporter Lexie Littleton (Renee Zellweger), a stereotypical flapper whose beauty belies her hard-bitten journalistic temperament. In many ways, Randy Newman was a perfect choice to score a film like this, having already visited the time period in The Natural, and the jazz genre in Ragtime. Newman is a distinctively old-fashioned composer most of the time, and when intentionally channeling the musical styles of Gershwin, Scott Joplin, and those other icons of the roaring 20s, as he is here, his music is never anything less than authentic, although this authenticity is likely to be a turnoff for some listeners. Several pieces – notably the opening “Princeton Tiger”, “The College Game” and “Carter is Blue” trill to old fashioned big band and swing, dirty-sounding jazz, and the bombastic march stylings of Sousa, while others, such as “Good Old Princeton”, the mellow “Lexi”, the intimate “Ah Love”, and the warm-sounding “Up Close and Personal” are a little more serious, while remaining rooted in the conventions of the time period. Newman even engages in some flag-waving triumphant sports music in “The Ambiguity of Victory”, which is quite exciting and upbeat. What’s interesting is that, for much of the running time, the music sounds a great deal like Newman’s songs, without the singing, which will undoubtedly appeal to his fans.